Want to rip your DVD movies into your Mac to prevent scratch or loss? Want to convert DVD movies to your portable devices like iPhone, iPad, iPod, so that you can enjoy movies away from home? Want to share your favorite movie on Youtube with the whole world? Well, MacX DVD Ripper Mac Free Edition can help you accomplish all these tasks perfectly. Free Rip DVD Movie to MP4 MOV Android iPhone iPad etc. This free DVD ripper for Mac brings a great solution for Mac users to convert DVD to MP4, MOV, MPEG, MP3 at liberty on Mac as well as convert DVD to iTunes compatible formats for your Apple devices, such as iPhone, iPad, iPod, etc. Besides, it can also help users digitize DVD to FLV files to upload to website. More than that, with advanced audio and video setting options, it will guarantee the output files well while playback. 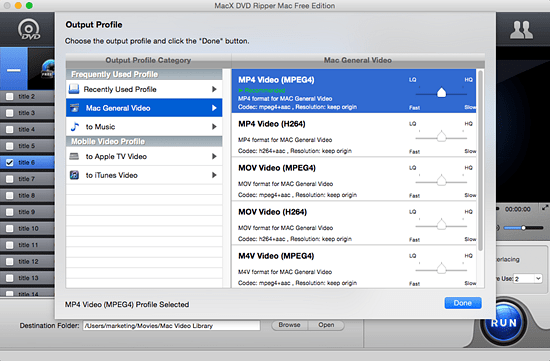 Below is the detailed guide on how to rip movie free on Mac with this Mac free DVD Ripper. Enjoy it now! This free DVD ripper for Mac is very fast to launch, user-friendly and simple interface make it easy to use, just a few steps you can get what you want. Free download and run this free movie converter on Mac, click "DVD Disc" to add DVD from DVD drive. Or you can click "DVD Folder" to import DVD from DVD folder saved on your computer. After free download this free DVD Ripper for Mac, click "DVD Disc" to add DVD from DVD drive. Or you can click "DVD Folder" to import DVD from DVD folder saved on your computer. Select the output format as you wish, like DVD to MP4, DVD to iTunes, DVD to MOV, DVD to MPEG, etc. After finish the above steps, click "RUN" to start the conversion. You can view the conversion progress and are able to cancel the converting process at anytime. Then you can successfully rip DVD movie free on Mac and play on your big screens iPhone/iPad/iPod. This is an easy and free way to take care of your DVD movie collections. By the way, this free movie converter for Mac supports converting almost any encrypted DVDs without hassle, including Sony ArccOS, CSS encryption, Disney DRM, region code (1-6), UOPs, APS, etc. And the free DVD movie ripper for Mac is updtaed frequently to support new movies on DVD. Tips: For later DVD movie playback on iPhone iPad etc. use MacX MediaTrans, a fast and simple-to-use file transfer tool, to move the free ripped DVD movie on Mac to mobile devices without iTunes syncing in a flash. Notice: We only advocates ripping dvd under the concept of Fair Use and does not encourage any illegal reproduction or distribution of copyrighted content. Please abide by the local DVD copyright law before doing it. This article shares you a solution to rip DVD to HTPC readable format MPEG 2 on Mac/PC for DVD playback on HTPC, so that you can play DVD movie on HTPC with multiple videos, audios. The list gathers the top DVD rippers in the world that will convert and rip DVDs homemade/protected smoothly and easily with good results. MacX DVD Ripper Pro is the best free DVD movie ripper for you to decrypt DVD with any encryption tech (Disney DRM & Sony ARccOS) and decode DVD to various video formats (MP4, MOV, MKV, AVI, FLV, etc) and portable devices with original quality.